When last week’s National Football League draft ended, Joel Bitonio of Wilson High School was the only Long Beach-area prospect that had the pleasure of hearing his name called by Commissioner Roger Goodell; but he wasn’t the only one to end up on an NFL roster. 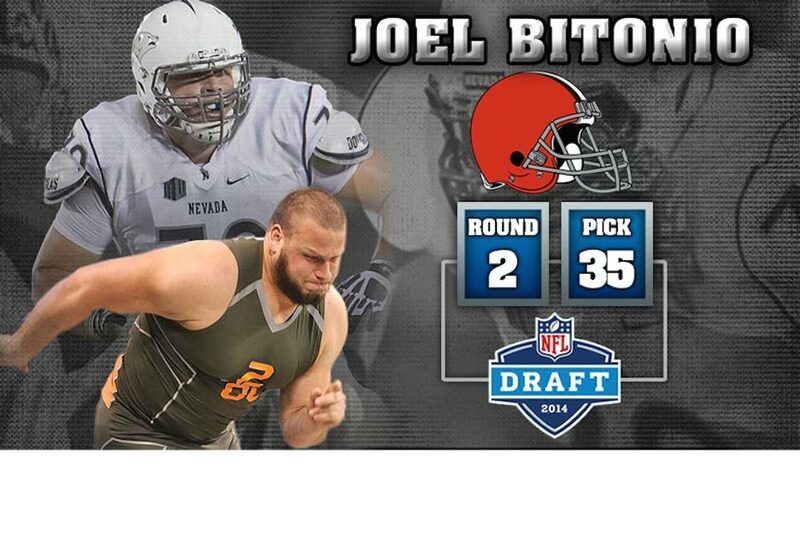 As expected, Bitonio–widely regarded as a top-50 prospect–was selected with the 35th overall pick by the Cleveland Browns. The versatile tough Bitonio will be charged with helping shore up a line that will most likely protect notorious quarterback Johnny Manziel, whom the Browns took with their first selection. Bitonio is projected to play guard but could end up at tackle depending on the team’s needs. “Any position the team wants me to play I think I’ll be ready to go and play that position well,” Bitonio told a local Ohio affiliate. Dion Bailey (Lakewood), Alden Darby (Millikan) and Kameron Jackson (Long Beach Poly) took different routes, all signing as un-drafted free agents. All three took to Twitter to announce their signings. Bailey slipped in the draft with many attributing his fall to concerns over his size (6′, 201 pounds) and where he’d fit into an NFL defensive scheme. It didn’t take long for the defending champion Seattle Seahawks to sign Bailey where he’ll be reunited with Pete Carrol, the coach he committed to play for out of high school but never did as Carroll left the school to pursue a second go-round in the NFL. Jackson announced Sunday that he had come to terms with the Indianopolis Colts. The Long Beach Poly cornerback who spent three years at the University of California before declaring for the draft. He is responsible for the only three interception game during the Jeff Tedford era at Cal which came in a 43-17 defeat of UCLA in 2012. Jackson joins 18 other free agents who are vying for a position on the Colts’ opening day roster. In the history of the NFL, there have been five undrafted free agents who have gone on to have hall of fame careers. Darby was considered to be a long shot to be drafted and was expected to sign as a free agent, which he did when he inked a deal the San Diego Chargers. In addition to having the opportunity to play for the team he grew up cheering for, he’ll also get to line up with a familiar face around as fellow Arizona State Sun Devil Marion Grice was taken by the Chargers in the sixth round. Darby is expected to challenge for a spot San Diego’s secondary, which outside of Pro-Bowler Eric Weddle, struggled mightily last season. If Darby makes the team, he’ll become just the third player from Millikan to play in the league. I’m proud to say I am officially a San Diego Charger !!! I grew up a Charger fan and now I’m playing for them. God is good !!! !